Anton Dexheimer was born on 19 June 1869 in Rhine, Sheboygan County, Wisconsin. Anton Dexheimer and Elisabetha Durking, appeared in the US federal census of 1 June 1870 in Rhine, Wisconsin. Other members of the household included Anton Dexheimer, Mary Dexheimer, Henry Dexheimer, Herman Dexheimer, Louise Dexheimer, Magdalena Dexheimer, William Dexheimer, John Dexheimer, Elisabeth Dexheimer and Henry Duerking. Anton Dexheimer and Elisabetha Durking appeared in the US federal census of 1 June 1880 in Rhine, Wisconsin. Other members of the household included Anton Dexheimer, John Dexheimer, Elisabeth Dexheimer and Edwin Dexheimer. He married Jennie Harbrecht, daughter of John Harbrecht and Charlotte Deford, on 20 July 1899 in Rhine, Wisconsin, in a civil ceremony, witnessed by John Klein and Antoinette Harbrecht. Anton Dexheimer and Jennie Harbrecht appeared in the US federal census of 1 January 1920 in Holland, Brown County, Wisconsin. Also in the household were children Viola (age 18), Roland (14), Elda (12), Elvira (6) and Anthony (5), as well as son Harvey and his wife Leona, both age 20. He was a farmer, accordig to the 1920 census. The following appeared on 20 November 1930 in The Sheboygan Press: (Kiel) Funeral services for Mrs. George Rothmann, 65, who committed suicide at her home here Wednesday, will be held Saturday at 2 p.m. at the home, 815 N. Seventh street, with interment in Kiel cemetery. Rev. Edward L. Worthmann, pastor of St. Peter Reformed church, will officiate. Mrs. Rothmann before her marriage was Miss Elizabeth Dexheimer, a daughter of the late Anton and Elizabeth Dexheimer. She was born on a farm in the town of Rhine on July 14, 1865. She was married September 27, 1891, to George Rothmann of Garnet, Wis. The couple made their home here. After operating a blacksmith shop here for a number of years, Mr. Rothmann retired in 1912. He died two weeks ago, and despondency over his loss is believed to have prompted Mrs. Rothmanns act. Relatives said she had been morose. Survivors are a sister, Mrs. Peter Schueler of Marshfield, and three brothers, Anton Dexheimer of Sherwood, William Dexheimer of Sheboygan, and Edward Dexheimer of Marshfield. She was a member of the Kiel camp of the Royal Neighbors. The organization members will attend the services in a body. 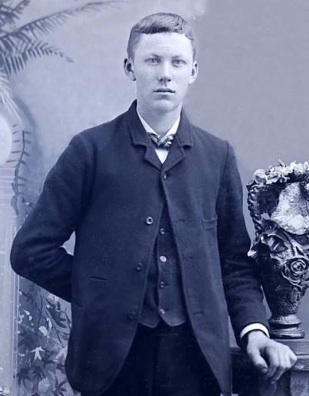 Anton Dexheimer died on 15 November 1936 at age 67 in Wrightstown, Brown County, Wisconsin. Jennie Harbrecht became a widow at his death. He was interred at Saint Johns Cemetery, Elkhart Lake, Sheboygan County, Wisconsin.